What people choose to eat doesn’t just affect their waistlines, but maybe also the way they think and feel, according to a growing body of research. Some Americans may believe that eating “comfort foods” leads to happiness. But often choosing to eat processed foods like ice cream, macaroni and cheese or chips may eventually be linked to poor mental health, research suggests. A selection of unhealthy processed food snacks are displayed in an undated stock photo. In some studies, healthy eating — fruits, vegetables, healthy fats and whole grains — was in fact linked to lower risk of depression and even suicide. In one recent study, the Dietary Approaches to Stop Hypertension (DASH) diet — low in foods with saturated fat and sugar — was found to reduce the risk of depression later in life. The risk of becoming depressed over time was 11 percent lower among adults who followed DASH, a diet rich in vegetables, fruit, whole grains, and fat-free or low-fat dairy products, the study found. Various fruits and vegetables are pictured in an undated stock photo. In the same study, which was done by questionnaire regarding food choices and depression symptoms, people who reported following a Western diet — high in saturated fats and red meats, low in fruits and vegetables — were more likely to develop depression. What is the connection between diet and brain health? Most people experience occasional, “situational” depression, or what doctors call an adjustment disorder, for example when a person loses a job or experiences a difficult breakup. Depression is a persistent loss of enjoyment in things you used to love, a slide into lethargy and despair, sleep problems and disinterest. Since what people eat -– the nutrients available to the body -– affects various bodily functions, it seems logical that diet would affect chemistry and mood as well. Diet decisions that improve the rest of the body may improve the brain’s outlook on the world. Various grains, lentils and whole grain breads and pasta products are displayed in an undated stock photo. Nutrition also influences the immune system, which has been shown to influence the risk of depression, as well. It could also come down to inflammation, research shows. A study published in January gave more support to the theory that increased inflammation in the body could play a role in depression. The study, published in The Journal of Clinical Psychiatry, found that people who had depression had 46 percent higher levels in their blood samples of of C-reactive protein (CRP), a marker of inflammatory disease. Diets like DASH and the Mediterranean Diet — another brain-healthy diet with a focus on foods like olive oil, fish and vegetables — are both rich in anti-inflammatory foods. 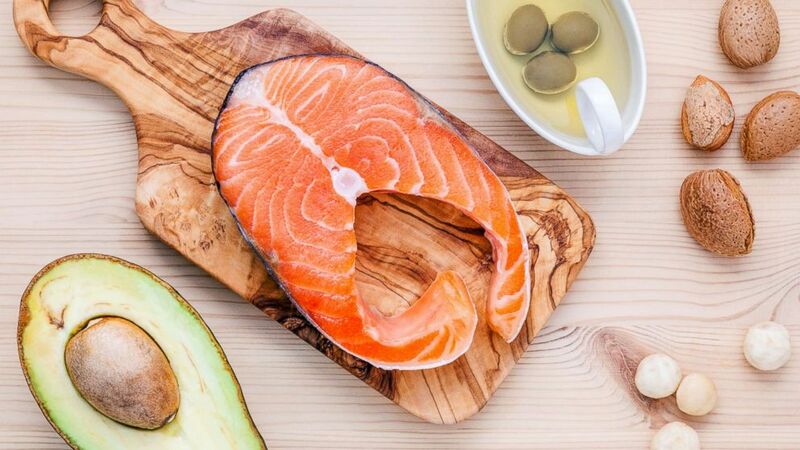 A selection of food sources of Omega-3 and unsaturated fats including various nuts, olive oil, salmon and avocado are pictured in an undated stock photo. Foods like white bread, margarine, red meat, processed meat and fried foods can cause inflammation in the body and should be eaten minimally or avoided, according to Harvard Medical School. Tomatoes, olive oil, green leafy vegetables, nuts, fish like salmon and sardines and fruits like oranges and strawberries are all foods that fight inflammation, according to Harvard’s list. ABC News’ Ann Reynolds and Jay-Sheree Allen, MD, a resident in the ABC News Medical Unit, contributed to this report.